My son with autism needs to keep his hands busy quite often. They're always fidgeting or touching something. Or he has them in his mouth. So waiting in line or for appointments can be a bit of a challenge for him some days. Whenever we go out and about, my purse is usually filled with fidgets, chew necklaces, snacks, a calculator, and more. But sometimes they don't cut it or sometimes I just bring my wallet and keys, leaving my purse at home. 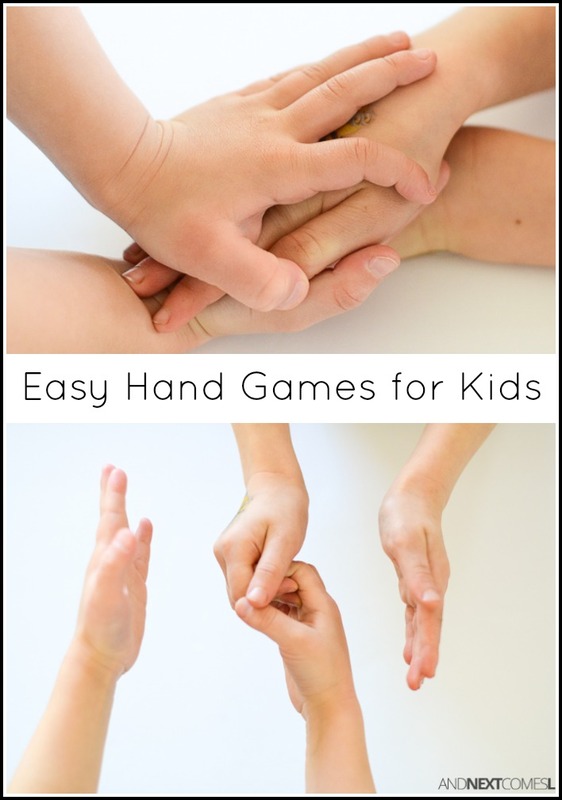 That's when I usually need to suggest one of these easy hand games for kids to keep his hands busy. 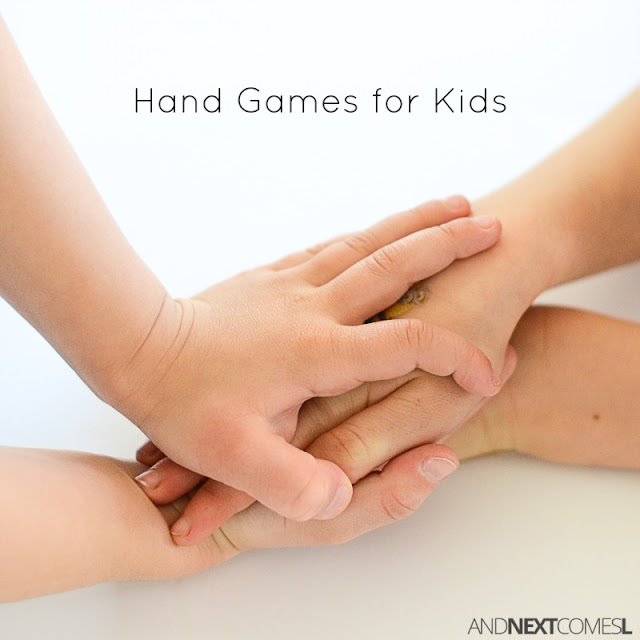 These hand games are great boredom busters and brain break ideas for kids with autism, SPD, or ADHD. However, all kids will love them! The best part is that these games require nothing more than two sets of hands, making them the perfect games for on the go! All ten of these games for kids require two players (minimum) and use just their hands to play. No fancy materials required! They're perfect to play with fidgety kids while waiting in line, waiting at the doctor's office, riding in a shopping cart, etc. They make great boredom buster activities while out and about or great brain breaks while at home or in school. You can play this game with as many kids as you'd like. Simply take turns stacking a hand on top of the other person's hand higher and higher. Whoever's hand is on the bottom of the stack goes next. Keep stacking hands until you can no longer reach the top. You can also play the game backwards. The hand on top of the stack goes next and adds their hand to the bottom of the stack. Or try stacking your two hands at the same time, alternating turns with the other player(s). Similar to the hand stacking games, you can stack your fists. 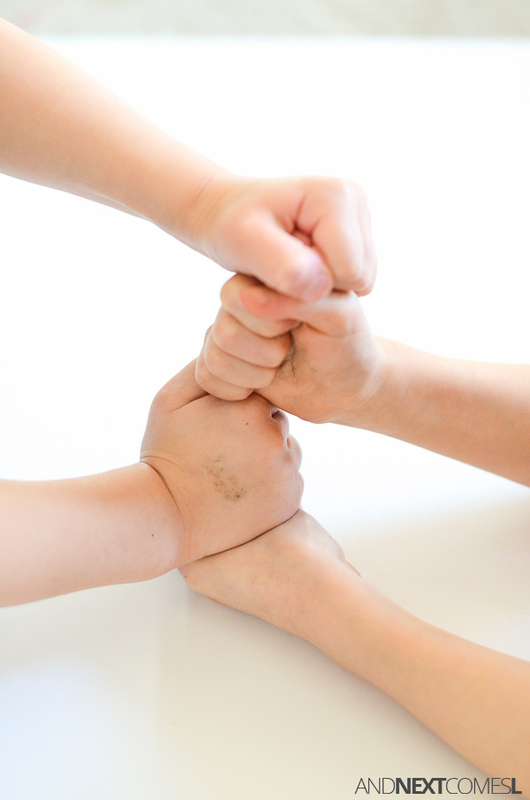 Each player makes a fist and takes turn stacking their fists higher and higher. Again, the fist at the bottom of the stack goes next and play continues until you can't reach any higher. You can also try playing the game backwards by stacking downwards. Or try stacking your two fists at the same time (just stack your own fists on top of each other). 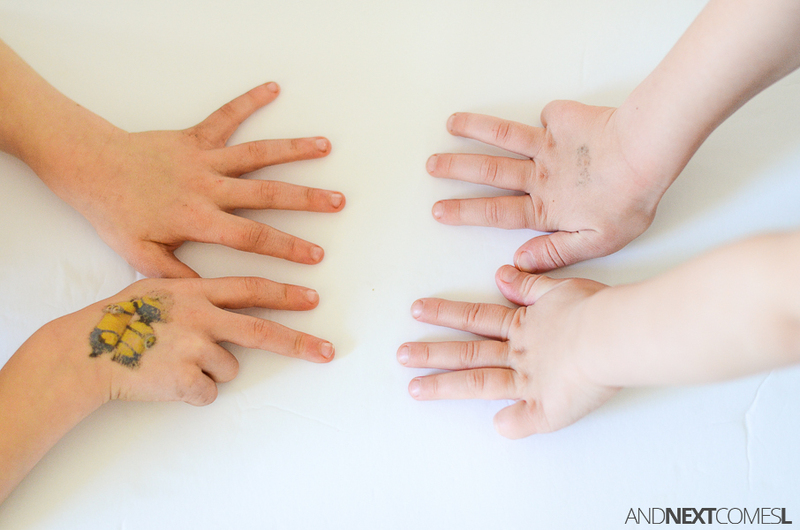 My kids became obsessed with secret handshakes quite a few months ago and they are such a fun hand game to play! You can either come up with your own secret handshakes or try some of the ones found in these awesome videos. Our personal favorites are ice cream, the big A, jazzy jeff, and the lumberjack. You can also find these secret handshake videos on my brain break videos for kids playlist on YouTube. 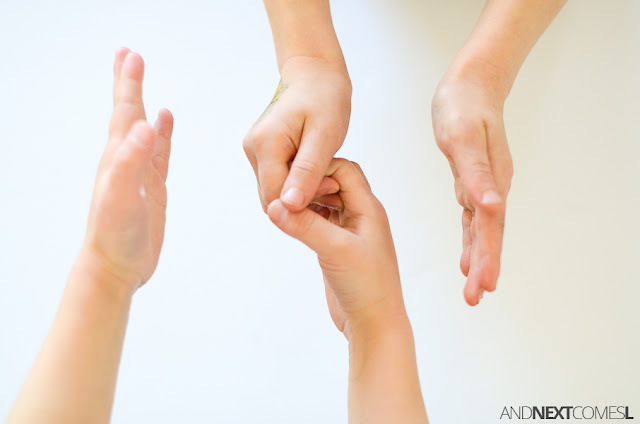 No list of hand games for kids would be complete without rock, paper, scissors. Pretty sure this game doesn't need any explanation. "1, 2, 3, 4, I declare a thumb war!" Simply link same hands together in a fist with the other player and have your thumbs wrestle. The first one to pin the other's thumb wins! One person holds up one or both hands in different positions and encourages the other person to give them a high five (or high ten). Possible positions include a high five, low five, high ten, low ten, one hand high and one hand low, two hands really far apart, crisscross high tens, or crisscross low tens. Be creative and see if you can come up with different positions! Don't forget to try "down low...too slow!" 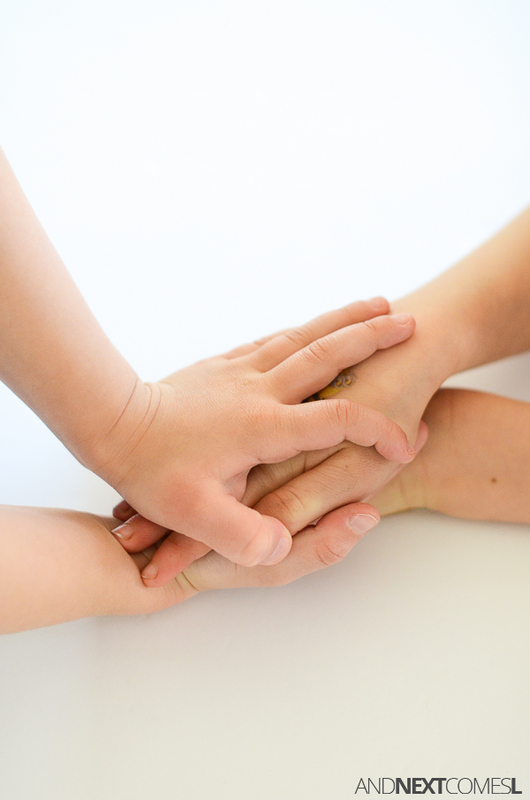 When I play these high five games with my kids, I try to do them rapidly. As soon as they high five or high ten, I switch to a new position. And usually the more ridiculous positions the better as it really gets them giggling! Especially if I do a really wide high ten where I stretch both of my hands out as far as possible. Obviously, my kids cannot reach both hands at the same time since they're still little, so they end up laughing hysterically when I do that. We play the two player version of this game, the same one that I played as a little girl. Both players hold their left hands up and then join their right hands together. As you sing the song, you move the joint right hands back and forth, slapping against the left hands with the beat of the song. At the end, you have to try to slap the hand that lines up with the final word of the song while the owner of that hand has to avoid getting their hand slapped. The words that I sang as a child are different from what I could find on YouTube, but you could really make up any chant you want. To play this game, pretend you are about to play rock, paper, scissors. However, instead of picking rock, paper, or scissors, you display any number of fingers that you want (anything from 0 to 10). The other player picks a random number of fingers to display as well. Then you try to multiply the two numbers together as fast as you can. So if person A holds up five fingers and person B holds up two fingers, then you have to shout ten as fast as you can. This game is a hit with my six year old with hypernumeracy. Similar to the multiplication game, except that you add the fingers together. We usually call this game "1, 2, 3, add 'em up!" So if person A holds up two fingers and person B holds up all ten, then you have to shout twelve as fast as you can. This game is a hit with my six year old with hypernumeracy. One player holds both hands with palms facing up. The other player places their hands with palms facing down and hovering slightly above the other person's hands. The player with their hands on the bottom tries to pull their hands out and gently slap the top of the other player's hands, while that player tries to move their hands out of the way before getting slapped. The key is to slap gently! If your kids know some sign language, then you can ask them to spell words using alphabet signs. I taught both of my kids how to sign when they were babies, a skill that came in handy with my hyperlexic son's speech delays, so every so often we like to play this game to keep our ASL signs in tip top shape!